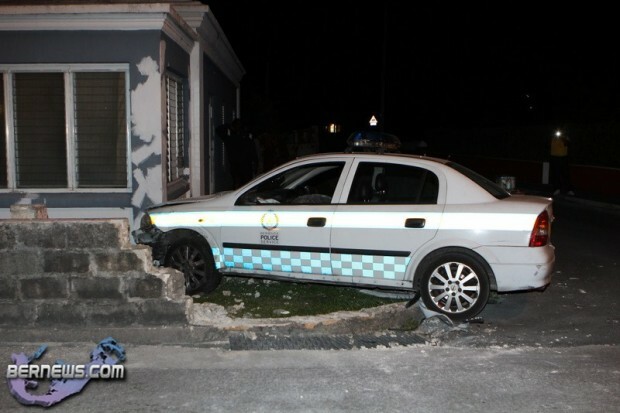 [Updated] This evening [Oct.27] a Police car was involved in an accident which saw it crash into a wall on Somerset Road. 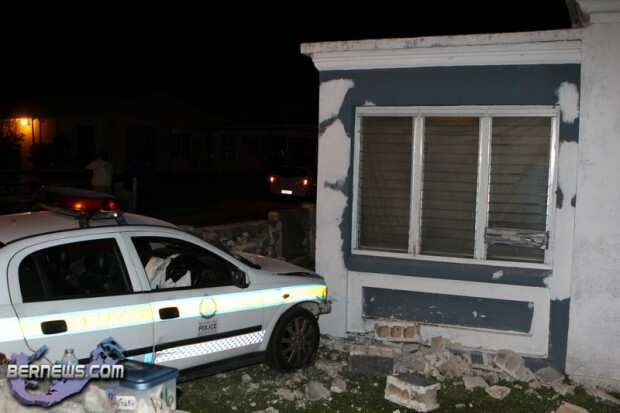 The incident was apparently a two vehicle collision involving the police car and a private car, with at least one of the car occupants sustaining minor injuries. Police presently have the road blocked off while they investigate the incident, and bystanders have gathered to watch the proceedings. Details of what occurred are unclear at this time, however we will update with an official statement as able. 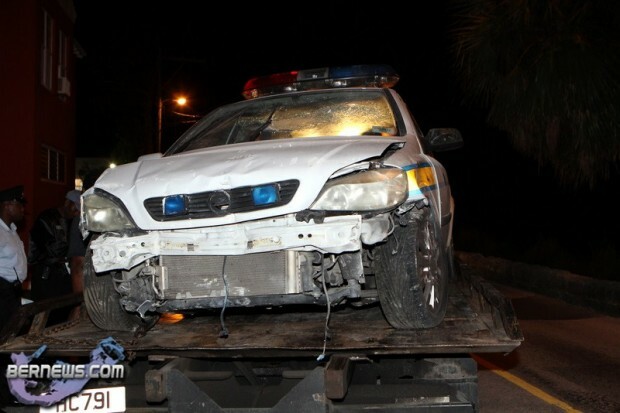 Around 8pm on Thursday October 27th, Police responded to a report of a two vehicle collision on Somerset Road in Sandys near the junction with Gilbert Lane. It appears that a private car was travelling on Somerset Road and a marked police car was travelling on the same road responding to an incident with its emergency equipment activated when the vehicles collided. 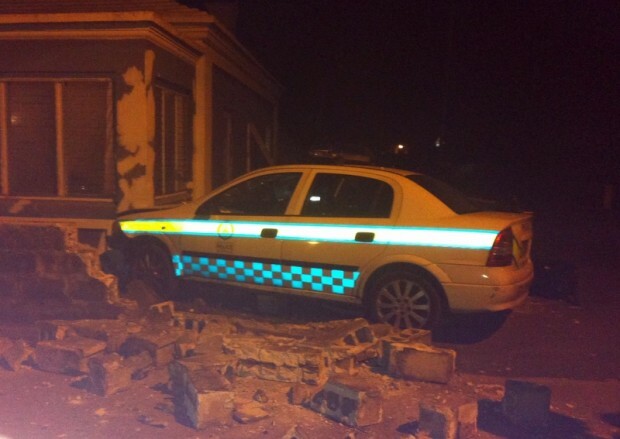 As a result, the police car also collided with the wall of a nearby property. The officer driving the police vehicle was not injured and the driver of the private car, a 31 year old Sandys man sustained relatively minor injuries and was assessed at the scene by EMTs. Inquiries into this incident are underway. Hope the officers are ok! Cars are replaceable. Lives aren’t. Just read another car was involved so hope all involved are ok. I beieve this was a chase.The police car and another went by our location near Port Royal at a very high rate of speed. I happned too be there and witnesed this and the police officer was driving with excseive speed!!! You’re a bright one Sherlock, when police officers respond to serious incidents don’t they have to “drive with excessive speed!! !” or should they drive like little Miss Daisy so you can have something else to complain about? cheeeesh! You think it’s ‘funny’ that the police car crashed and the bad guys got away? I think we should all be rooting for the police these days, with all that’s going on. Glad no fatality. Any pictures of the other car coming? reckon Terry should return and give his boys some driving lessons!! Any details yet as to what exactly caused them to crash? Out of all the excitment, you shold have seen the childish fools all in the face of the driver of the Police car. shoulding in his face got their phones taking pictures of him. I was embarassed to be there. Why am I not surprised at that type of behaviour. Seems to be the norm these days. No class. No manners. No respect. No pride. I hope one of those idiots gets into an accident and the police act in the same disgusting manner that these fools think is acceptable. There should be a law against publicizing photos or emails about crimes, murders etc., that circulate around the internet, faster than a ‘blink of an eye’ YET THESE SAME CRAZY PEOPLE WONT GIVE ANY INFO OR EVIDENCE TO HELP POLICE! These people hamper investigations etc. Can’t these ‘nosey’ people be traced and prosecuted? It is also very hurtful to the victims and families involved, who are not even aware of incidents about their loved ones, yet it is sent on a blast around Bermuda. Shameful and no class! it is really hard for the public to take the BPS seriously when every other week there is a crash. For goodness sake, BPS this is embarrassing. It looks as though the BPS are a bunch of bumbling idiots who can’t drive but want to be the first one to issue a ticket for the same thing. Do these policemen have to go to court to answer the same charges as I would and moreover for damaging the Crown’s property? It’s simple, put up more CCTV’s and leaving the driving up to the more experienced. Minor, you sound like a bumbling idiot who is either ignant or angry. Nothing nice to say bout dee “bunch of bumbling idiots who can’t drive”. I think they either gave you one too many tickets or locked up too many of ya boys. Matter fact, just last week I called dee “bunch of bumbling idiots who can’t drive” for help and they bumbled to my neighborhood pretty quickly and dealt with dee matter very well. My hat goes off to dee “bunch of bumbling idiots who can’t drive” and if i need em again, I’ll call em but you Minor, I think you should call dee ghost busters they might be able to assist you better. Cheesh! doesn’t sound like a chase to me. some police just don’t know how to drive! ridiculous! I’m all for bigging up the police and WANT them to catch the bad guys… perhaps they need to drive first! Well from someone who was there’s mouth, The police car was going at an excessive speed and DID NOT have on its emergency equipment as the police would like you to think!!! They put them on right before they hit the other car!!! As usual they will spin the story so they are seen as not at fault!! typical! Just me, that sounds a bit difficult to believe. So you’re saying that the police officer was driving at an excessive speed, saw a car up dee road, went to overtake it, possibly saw a potential accident but instead of a few critical seconds to hittin’ dee brakes to avoid crashing he says “I think it’ll be fun to smack dee car and plow into dee wall, lemme jus turn dee lights on quickly n brace myself for dee impact” Cheesh! yo DUMB DUMB…. glad thats ur name, cuz thats exactly wha u r! y would anybody want to make up a story to b against the police! for once THEY were in the WRONG n now ppl like u dont believe the public. Had that been ANY1 OF THE PUBLIC… its GARUANTEED that the person would’ve been breathalized and perhaps takin to the station for the night!! Furthermore the officer was then TAKIN from the scene B4 investigators arrived.. Tell me when else does that happen, where a person is allowed to b takin from the scene of an accident!?!? My apologies, for not being gullible and believing everything that people say. Perhaps you were there and saw it at. Furthermore I’m a logical thinker and “Just me” said that the police turned the lights on just before impact. No sane person wants to crash into anything so I would imagine that the police officer would’ve tried to jam brakes vs turning on some damn lights, surely he couldn’t do both. And furthermore to, “y would anybody want to make up a story to b against the police!” People do lie and i can think of a million reasons why SOME PEOPLE might want to do that. I’M SURE YOU CAN TOO. Cheesh! its amazing how some people seem almost jumping with joy that the police crashed a car during the course of their duties. People crash their cars all the time yet we seem to expect our Police to be infallible; considering the driving conditions that they operate under accidents will happen.It is unfortunate that this accident happened and luckily no one was hurt.